Maestro is known all over the world as one of the leading names in debit cards. 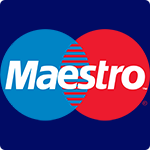 The Maestro brand name was formed when MasterCard and Europay joined together on this brand new venture. The Maestro card is used like any other debit card and is accepted in over 100 countries worldwide and of course also in the wonderful world of the web! This means that you have a secure and easy to use payment method using your personal Maestro card at any online casinos that support Maestro. The main advantage point with Maestro over other credit cards is this will never allow you to overdraw so you cannot spend more than you have in your Maestro bank account! This is great news for online gambling enthusiasts as the temptation to overspend can soon remove all the fun of your favorite slot machine in no time! To make paying with Maestro card over the internet there is an added secure code that gives you that extra safety feature that can much needed when depositing online. This secret code is an extra step to safeguard your money, and the only two people that know this code will be you and your bank. Mostly all online casinos will accept this secure code feature and the number is growing rapidly. The way this works differs from bank to bank, some will ask you to choose your own password to enter every time you want to make a deposit at an online casino or elsewhere on the internet. Other banks will give you a whole range of passwords that will be installed in a key; once you press the button on the key a unique code will appear for you to use one time only to make your payment using your Maestro debit card. So once you insert your Maestro card number the secure window will pop up and once you have inserted the correct password you are good to go and your deposit or purchase will go through smoothly and efficiently! The perfect way to pay for all your online needs! This makes your paying and playing online so much simpler, as you will only be playing within your means and you can log on and deposit from any computer in any of the online casinos that accept Maestro in over 100 countries across the globe! Time to sign up for a debit card and get playing.